Baseball cards and comic books. Those were the two imaginary-world pillars that my inward childhood was built on. 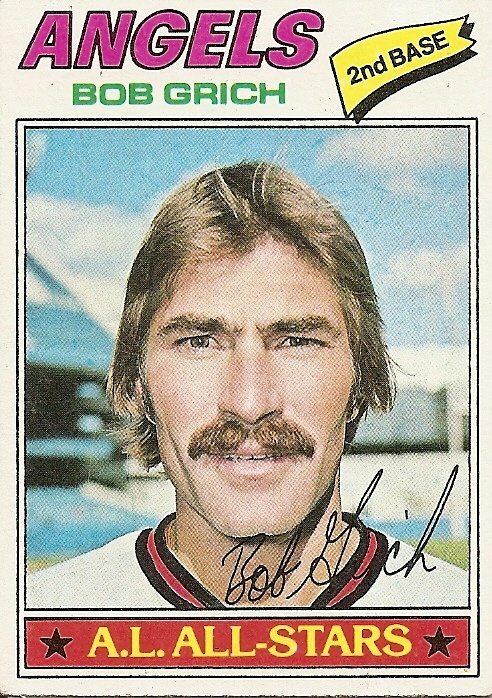 The two worlds come together here in this 1977 Bob Grich card, which always has and always will remind me of Marvel comics artist Jack “King” Kirby’s lantern-jawed, dimple-chinned heroes, who often paused amid dire intergalactic battle to fill the entire comic frame with their chiseled heads and deliver clear-eyed pronouncements of urgent courageous purpose, just as Bob Grich seems to be doing now. Most baseball cards imply that the next moment beyond the moment of the photo will be a few batting cage swings or a saunter to the outfield to snag some flies. But here it seems more likely that Bob Grich—as soon as he is done uttering something along the lines of “He has gone mad with power and MUST BE STOPPED!”—will in the next rectangular frame chronicling his adventures leap high into the sky on superpowered legs to collide jarringly with a dark muscular otherworldly destroyer with dead eyes and ornate Aztec-inspired headgear. As far as I know Bob Grich never tangled with Galactus or Modok or The Red Skull or even, I don’t know, chin music enthusiast of the Cardboard God era, Ed Farmer. I think Grich did once scream at Earl Weaver for pinch-hitting for him too often when he was a rookie, but no blows were thrown by either man. Instead, Grich just fairly quietly went about his job, over the course of his career creating a body of work bettered by only a couple handfulls of second basemen in major league history (Bill James, a longtime advocate of the underrated Grich’s estimable worth, ranked Grich as the 12th-best second baseman of all-time). This card heralded the beginning of Grich’s stay with the Angels. Interestingly, I have no memories of Grich beside this card until a moment at the very end of his Angels sojourn, which also happened to be the end of his career. The reason the latter moment, which came during the Angels’ 1986 American League championship series against the Red Sox, stands out in my memory is that once again Bob Grich seemed like a character who’d be at home in the pages of a superhero comic. I don’t recall exactly when the moment occurred, but it was either after the Angels’ third win, which put them up three games to one, or after the Angels took a commanding lead in the next game. The California sun was shining down, the home fans were screaming joyously, and Grich leapt into the air to give a seismic high five with a teammate, who in my memory was the Angel with the bulging comic book musculature, Brian Downing. Both Angels, but especially Grich, seemed larger than life, as if with a couple uncanny Hulk-like leaps he could bound all the way across the continent to New York to finally participate in his first World Series. He shrank back down to human size soon enough, I guess. In fact, I don’t remember seeing him during the Angels’ ensuing collapse. He became like the rest of us once again, who are only ever superpowered in our dreams. You are currently browsing the archives for the Bob Grich category.